What might that be, you ask? 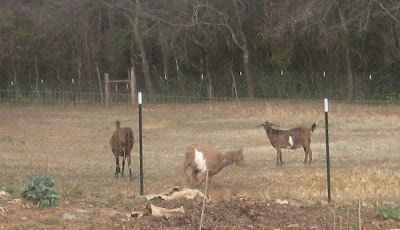 My front yard. 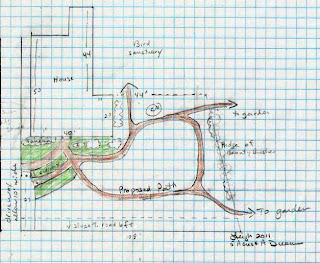 To be more specific, a goal that's been hanging over my head, namely, a design plan for my front yard herb garden. I planted a few dye and medicinal plants in one, and some culinary herbs in the other. 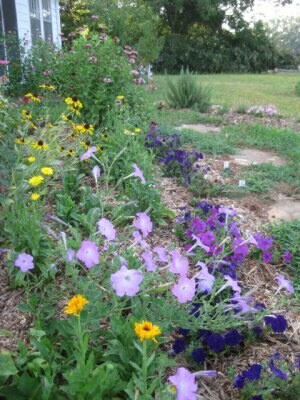 I planted petunias and zinnias as fillers. 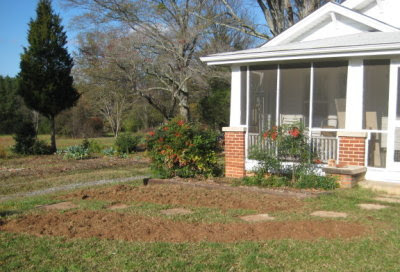 In an existing bed to the right of the front door, I planted echinacea purpurea, hollyhocks, and more zinnias. The goal is no lawn, and our front yard is perfect for sun-loving herbs and perennials. 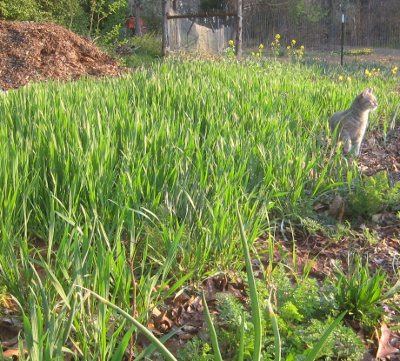 However, when I try to visualize the entire front yard planted in herbs, small shrubs, and flowers, I can't see it. I, who have a squillion ideas when it comes to things like remodeling the bathroom or designing the kitchen, have been stumped. So what's the problem. I have herb books with lovely plans for small herb gardens; The New Encyclopedia of Herbs & Their Uses and The Complete Book of Herbs are two of my favorites for that. The library has numerous others. My front yard though, is huge, 45 by 108 feet plus. 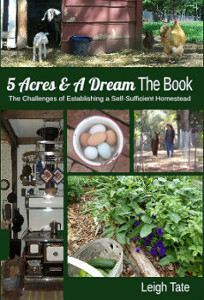 I could borrow ideas from various books and create a series of small gardens, but I couldn't visualize how to connect them as a whole. 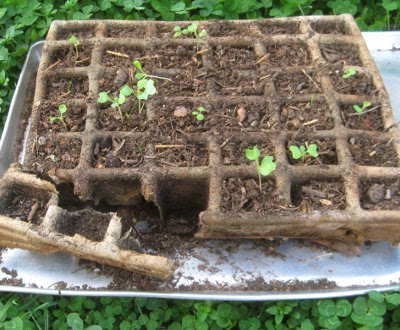 The first break-through came from Edible Forest Gardens , I think it was volume 2, Ecological Design And Practice For Temperate-Climate Permaculture (the one that's missing from my library.) 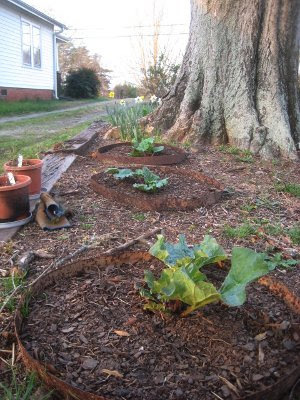 In creating permaculture pathways it said, one idea is to mimic the roots or branches of a tree, with smaller, narrower paths coming off of main ones. That appealed to me because I tend not to go for the formal, symmetrical look. 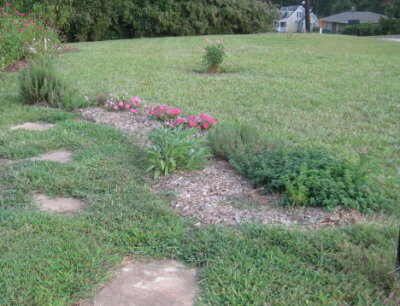 Deciding on a main path around the garden may not seem like much, but it was a major first step for me. 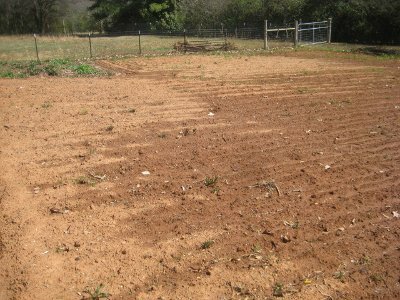 The secondary paths which shape the beds will come off of this. Though I don't have all of that figured out yet, at least I have the backbone. The second really helpful book I found (also at the library) was Ann Lovejoy's Organic Garden Design School. 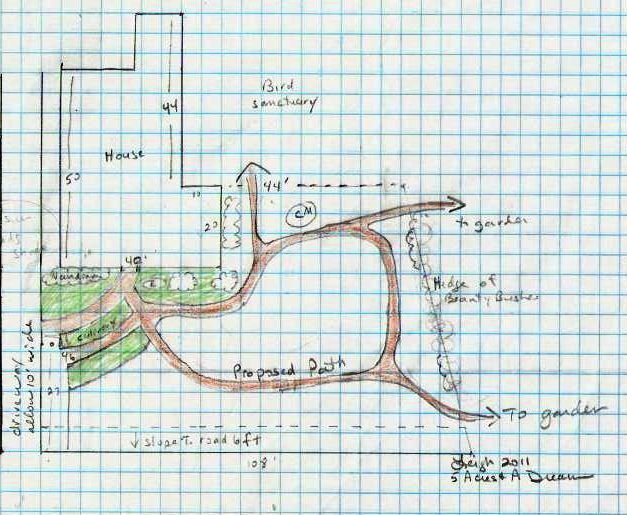 As I read it, I began to understand some of the problems I was having, and why it's harder to design a perennial garden than a room in a house. When remodeling a room, one can experiment with picture or furniture arrangement. Color schemes revolve around a limited palette. 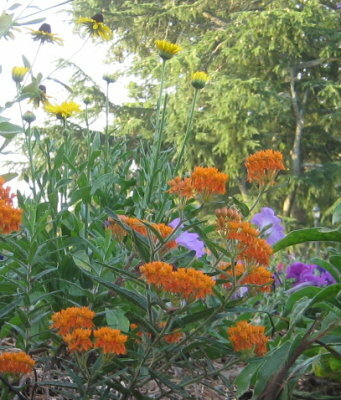 A permanent garden however, is multi-dimensional, multi-seasonal, polychromatic, and changes as the plants grow. The final result isn't realized for a long time, and if the design isn't pleasing, it's no small task to change it. I've had haphazard looking flower and herb gardens in the past, and don't want another. As I've worked through the exercises in the back of Ann Lovejoy's book however, I find that I'm worrying less and enjoying the process more. Slow progress on a project doesn't bother me, but a standstill does. 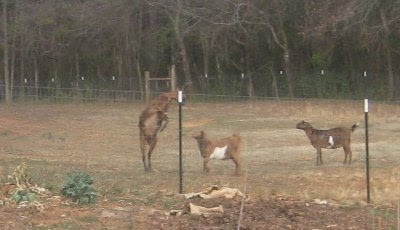 I'm just relieved that it finally feels like we're getting somewhere, and I can move forward on the herb garden again. 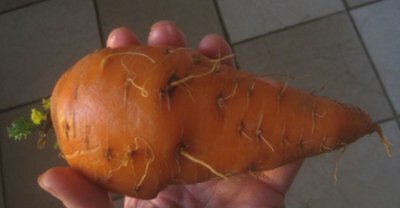 This is one of my Scarlet Nantes carrots. Looks mighty fine, doesn't it? Here's the other side. Now, there's not a tooth or bite mark on it. 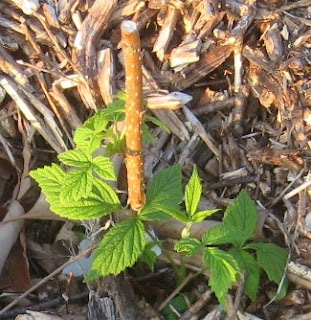 The core is intact, with exactly half a full length outer part to the root. The rest is hollow. 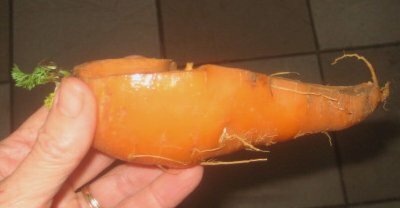 When I pulled this one, I could feel that there was only half a carrot there. 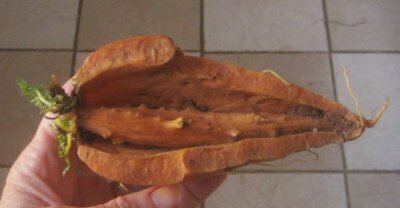 The hollow inside half was filled with dirt, which I washed off for the photo. I honestly don't think it was eaten. Besides no tooth marks, why would something eat only half like that, eating around but leaving the core? But could it really have grown that way? A mystery to ponder. Windows. Hardly any of the kitchens in the books and magazines have window treatments. Whatever happened to kitchen curtains? Or even blinds or shades? Does anyone have bare kitchen windows like that? Doesn't that make you feel exposed? What if you want to run into the kitchen in your underwear? Especially at night when you can't see out to know if anybody might be around to see in. Please tell me about your kitchen windows. Appliance Garages. I admit these look kind of neat and I like the idea of being able to push some commonly used appliances out of the way. But I think it would eventually get annoying to have to do that little door up and down every time I needed one. And come to think of it, why would I want to hide my small appliances anyway? It's not like they're the messiest thing in my kitchen. Does anyone have an appliance garage? How do you like it? Do you bother to push the appliances back in after you use them? Do you keep the door mostly up or mostly down? Rugs. Now, I really like the look of a few throw rugs in the kitchen. Pretty on the eyes and easy on the feet. But personally I find they are way too hard to keep clean. How many of you have rugs in your kitchens? Do you really truly like them there? Aren't they always full of crumbs, dirt, sand, cat/dog hair, and pizza sauce spills? How do you keep them clean? Peninsulas. Every peninsula is made with an overhang for stools. Does a peninsula have to accommodate seating? For one, we don't need it, and for two, nobody really likes sitting on stools to eat anyway. And so what if a peninsula can seat five. What kind of arrangement is that for a conversation? It seems like islands can get away with no seating, but it's expected with a peninsula. Does anyone have stools at your island or peninsula? How often do you use them? How often do you eat there? Do they ever get in the way? Work Triangles. OK. Whats the deal with work triangles. Honestly, how many of you work in a triangle? When I cook it's: sink, fridge, cabinet, pantry, garden, outdoor faucet, sink, countertop, sink, cabinet, stove, shelves, countertop, stove, sink, pantry, dining area, cabinet, fridge, dining area, sink, fridge, countertop, shelves, stove, sink. Where's the triangle in that? Yet every book and article on kitchen design tells us we have to have one. I did find an article online, and learned that work triangles were devised in the 1950s to test kitchen layouts in government financed housing. 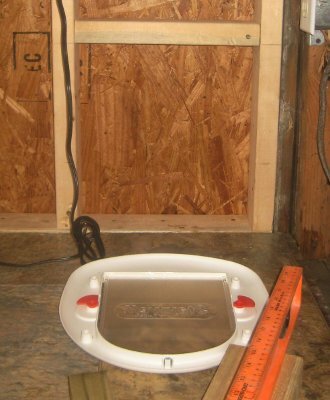 The ideal distance was deemed 4 to 7 feet between sink, refrigerator, and stove. The rationale was that this either saves steps, or keeps the cook from constantly having to walk around appliances. Even so this doesn't seem logical because it takes more than a sink, fridge, and stove to prepare a meal. I've noticed that modern kitchen triangles go anywhere from straight lines for one wall kitchens, to triangles with bumped out legs to accommodate huge islands and peninsulas. I've also read enough kitchen forums to know that lots of folks (myself included) think that 48 inches is too far for some set-ups. (Can you say "water from freshly rinsed vegetables dripping all over the floor"?) It's curious that kitchen designers would hang on to this concept. Needless to say, I'm not worrying about triangles in my kitchen. Please tell me, how does your work triangle work for you? What's your ideal distance between work areas? Are you conscious of your "work flow" and able to organize every step around the most efficient footwork? If you are, I need to know your secret. Kitchens as Entertainment Centers. Maybe this is a sign of the times, but rarely do I see kitchens treated as a workshops. The rare exceptions are the personal home kitchens of professional chefs. More commonly, book descriptions point out amenities for guests and multiple cooks, and open concept architecture which enables the cook to remain part of the action elsewhere in the house. In addition, they are big on things like a fully stocked cappuccino center and little sinks designed solely for washing celery. Decorator details seem to be the focus. We even found one that touted "the lived in look." Um, hello, we need to make the kitchen look like we actually use it? My question for you all is, how many of you entertain in your kitchen? I mean, how often do you work up a guest list for making an evening out of a group cook in? Personally, I find it's more trouble to find things for guests to do in the kitchen than to do it myself. Just don't leave before the dishes are done. The resale factor. OK, moving is a reality and we're considered the mobile society after all. Still, why do I have to design my kitchen based on what somebody else may want in the future? Why can't I make it the way I want? I mean, how many of you absolutely fall in love with those one size fits all, cookie cutter kitchens in homes you're looking to buy? I read that the number one room people want to remodel in their homes is their kitchen. Maybe kitchens designers should take a hint. Or, maybe they already did and generic kitchen design is the way to guarantee job security. Keeping future buyers in mind may be good advice for those whose house is simply an investment, but what about those of us who actually plan to live in our homes? What do you think? Books, magazines, and websites are fun to look at and great for ideas, but not for whole kitchens. I say this because most of them seem to be geared toward career minded folks rather than homemakers and homesteaders. That's where you all come in. Please tell me, what do you love about your kitchen? What would you change? If you could design your dream kitchen, what would be important to you? The floor is yours. The first cat door is in. 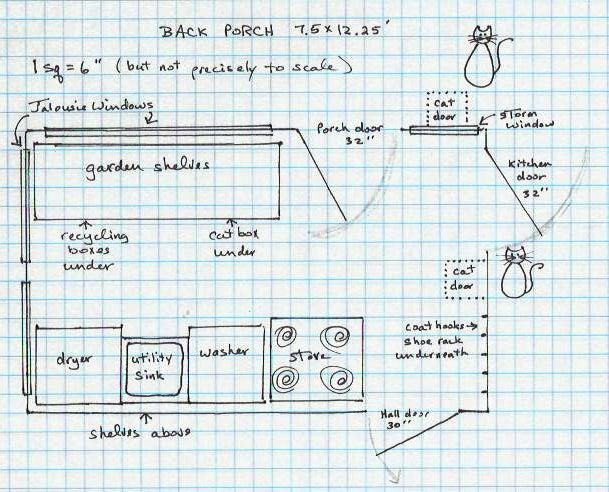 The back porch plan calls for two, and this is the one that goes from the porch to outside. 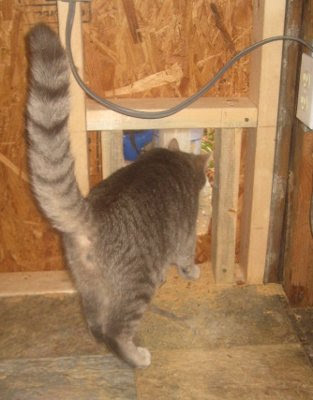 Originally we (cleverly) thought that we could use the old dryer vent hole in the wall for a kitty door. 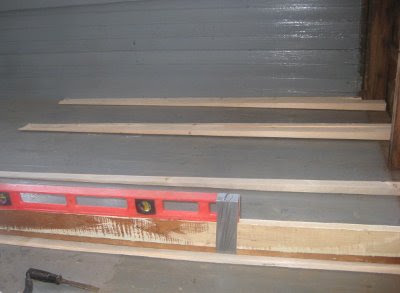 That was before we discovered the 2x4s in the wall were rotted and the wall had to be torn out and rebuilt. 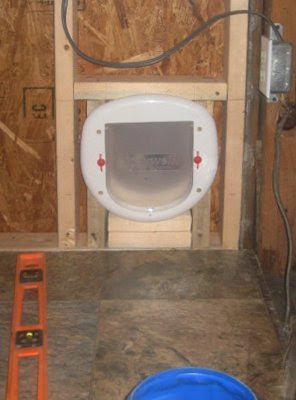 Even so, the cat door project was still in the works. All it required was some framing to support it. There are several types of pet doors: those that are wedged in a patio door or window, and permanent types that are installed in existing doors or walls. We wanted one that went through the wall, a 4-way model: in only, out only, in and out, and locked. But sheesh, have you ever priced that type for walls? They cost hundreds of dollars. The advantage to the wall types is that they are double doored for better insulation. Since the back porch is not insulated anyway, we decided that a less expensive door model could be adapted. Dan framed out the "passageway" with 2x4s and screwed the door to these. Once we get the wall up, the door will frame out the rough opening nicely. What do the cats think? Well, Riley was in on the construction, so he went right to it, though he was uncertain how to open it. Katy still ran to the people door, so I started showing them how to push it open. The biggest problem was that the strong magnet at the bottom of the door, made it a little stiff to open. I removed the metal clip so that the door swung more freely and it didn't take long before they started using it themselves. 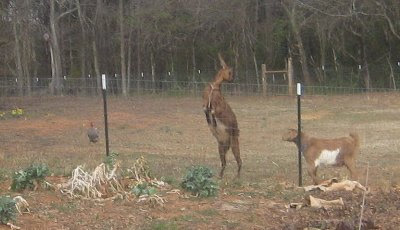 We still have to let them out onto the porch, but it's certainly easier than before. 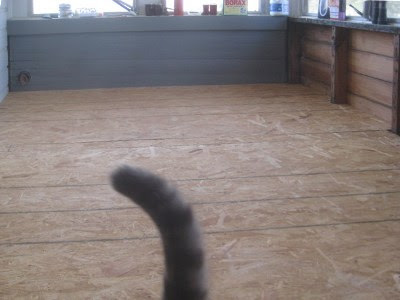 Once we get the second cat door installed in the kitchen wall, life will be kitty heaven around here. We managed to get the annual rye tilled in, but can't do anything else until the ground dries out. Even so, I have some garden goings on. 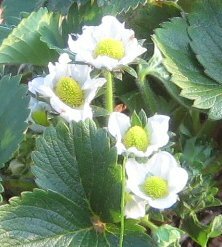 I told you about transplanting my strawberries and am happy to report that they seem pretty happy with their new home, as you can see by the photo on the left. My companion group garden plan called for putting the asparagus in with the strawberries, and I finally had to plant roots because they were starting to look not so good. I'm not very hopeful about these because the ground was still too wet. Time, I suppose, will tell. 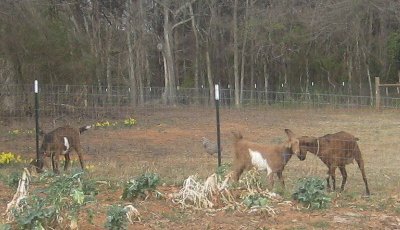 The turnips were starting to bolt too, so I pulled all except the ones I'm letting go to seed. 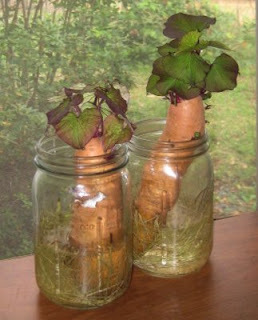 I imagine I'll be needing to do the same with the beets and carrots soon. 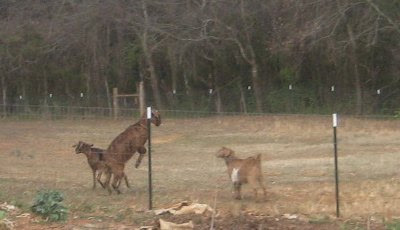 ... which seem happy there. 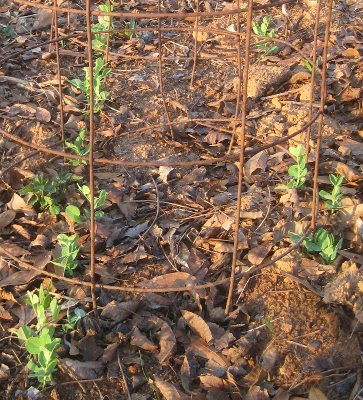 I'm using tomato cages as trellises. 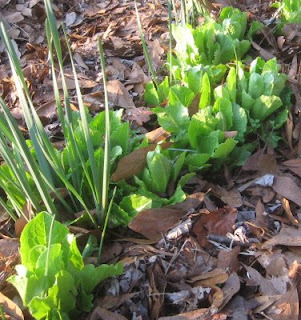 My garlic (above front) is doing fine, but the radishes and some of the mesclun is going to seed. All the rain and then a bout of warm weather caused quite a growth spurt. All this has me wondering about spring planting. 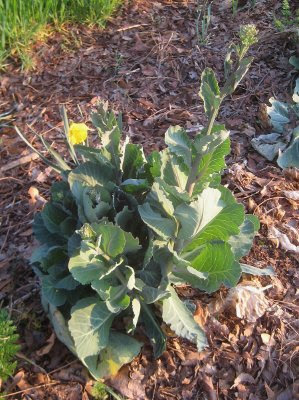 My fall garden did so well this winter, even with nights plummeting into the teens, that I wonder if I really need to plant cool weather veggies in the spring. 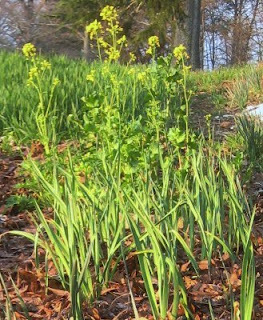 I mean, the spring planted ones seem to take so long to grow. Too long really, before hot weather sets in and either stunts their growth or causes them to bolt. I'm wondering if I wouldn't be better off with large fall plantings and good row covers for the greens. With good thick mulch, my root crops were available all winter and spring. 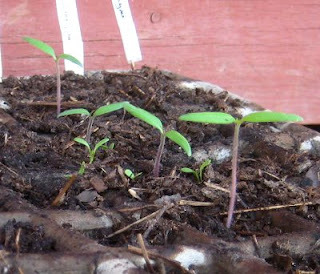 I'm thinking I don't really need to plant these in the spring as well, that I should just focus on an early start to my summer vegetables. This is the first time I've sprouted my own, so I'm not entirely sure about the timing. Because of the problem I had last year with black rot, I ordered another variety to try as well. ... and my peach trees in flower. 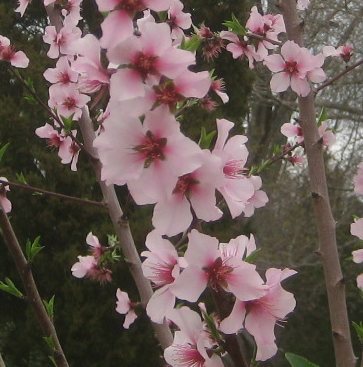 One of my 2 peach trees, can't remember the varieties at the moment. I'm just waiting for some longer stalks! Growing winter wheat. Cat included for size. These were pretty stunted last year and I lost two, so I'm hopeful they will do well this year. I didn't think I had much to show you, but it actually turned out to be quite a bit, didn't it? I have to admit that March has been a difficult month for gardening. I've been so anxious to be working in the garden, but have had to be patient and wait. 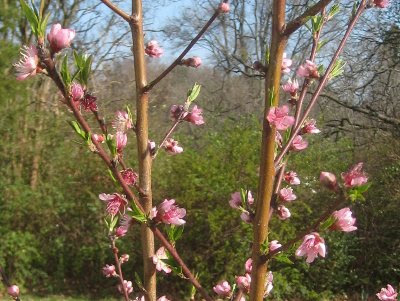 The middle of April is our average last expected frost, so planting and transplanting will start in earnest then. Hopefully the weather will cooperate. 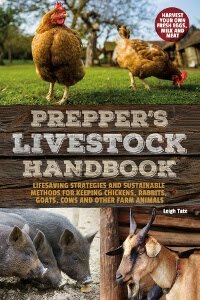 I have several changes coming up which have me thinking about my homestead routine. 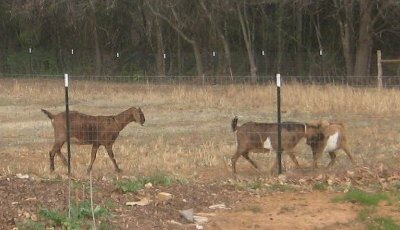 With baby goats on the way, milking will mean a big change in my daily schedule, not only with the goats, but in the kitchen, where I will need to strain and store the milk, sterilize equipment, and later turn our bounty into products we can use in the future, such as cheese and soap. The wood cookstove too. Once we get that in, cooking will need to take fire starting and tending into account, which will change how I organize my meal prep and cooking. As I think about these things, I can't help but analyze how I use my time now. I like to think I'm an organized person with an efficient routine, but follow me around for a day and you'd quickly see that that's not necessarily the case! I think a successful routine is due partly to organization, but that its foundation is a set of good habits. The problem with habits of course, is that new ones takes diligence to develop or change. And while organization is a skill which can be learned, I can't help but wonder if there isn't a quality of personality to it. I say that because many years ago, I was coordinator for a small food co-op (buying club), which consisted of about 12 homeschooling families. We ordered once a month, met the delivery truck at a local church, unloaded, divided up the order, paid the treasurer, cleaned up, and that was it the until next month. Over the years though, I made some observations about people, especially when it came to the group's routine and it's needs. Problem solving for example, always seemed to dissolve the group into two camps. One was the go-with-the-flow folks, who felt that problems would just work themselves out, so why worry. These tended to be more spontaneous in nature, and felt strangled by rules. The other group wanted structure. They liked a set routine, wanted to know what to expect, and tended to address problems with rules and guidelines. These felt that otherwise, everything seemed chaotic. I think about this from time to time, as I analyze myself and our homestead. I tend to find structure freeing, but on the other hand, I'm easily distracted because there are so many things to do. I realize that if I left the day to what I felt like doing, some things would never get done. On the other hand, I'm often caught off guard when unexpected things come up and I have to make a quick change in the day's plans. It's hard for me to switch mental gears at a moment's notice. The fine art of structure with flexibility is something that often eludes me. 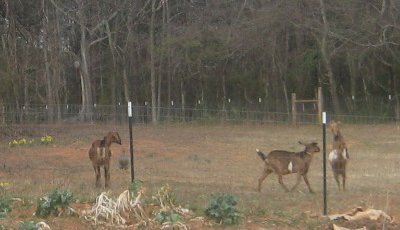 For us, a detriment to developing a homestead routine is that neither Dan nor I grew up with it. This is new territory for us, so to speak. We grew up in homes with parents who were 9-to-5ers, who looked forward to weekends, vacations, and retirement. Farming and homesteading aren't like that. They require a different mindset, a different lifestyle. We realize that we are still in an establishment phase of our homestead; that there are certain conditions that aren't routines of themselves. 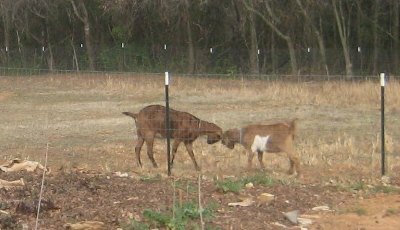 For example, not only has the house needed updating and repair rather badly, but we've had to clear out the overgrowth, break the ground, put up fences, prepare for and get chickens and goats, plant fruit trees, plan herb gardens, deal with septic system problems, etc. 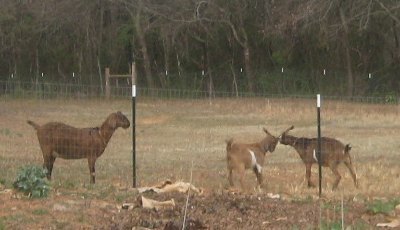 We still need to improve the pasture, fence for a pig, and a buck, get honeybees, prepare the ground for grain growing, build a greenhouse, install our water conservation systems, get a generator, etc. So many one time activities from which new routines will need to be developed. Do you all find the same thing to be true? Do new routines come easily for you? How have you found the lifestyle adjustment? What's been easy, what's been hard? I think motivation and self-discipline are key, but I'd love to hear what you think. After the new porch door was installed, Dan started to work on the porch floor. There were several problems with it; it was sloped, bowed and buckled. At the time this home was built (1920s), porch floors were sloped to accommodate run off from rain, but we wanted it level. 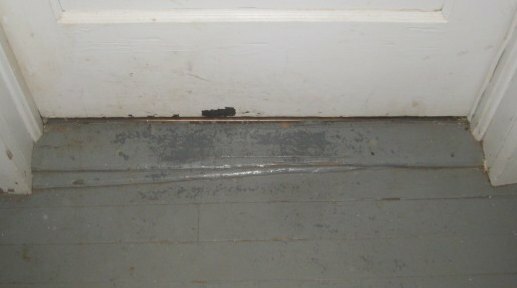 In the photo above, you can see how they dealt with the slope when they put in the kitchen door. 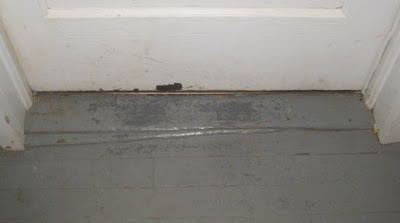 They angled another piece of wood up under the threshold to level it. Both our front and back porches were built with this slope. Actually the slope didn't bother me too much, but it bothered Dan. 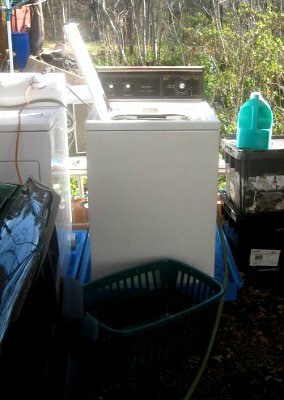 Plus it made it difficult to level the washer and dryer. To correct it, Dan made shims. These are angled the same as the slope in the floor. 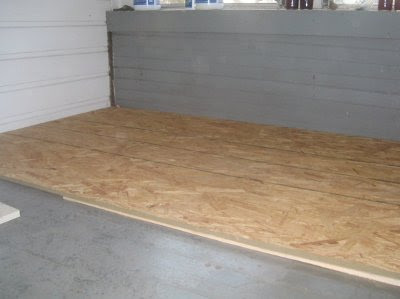 The OSB board was screwed to the shims and voilà! Level floor. The floor is not only level, but it feels more solid and sturdy as well. 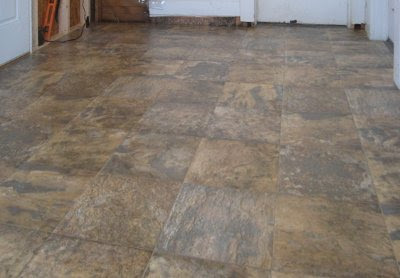 To finish it off, we decided to use vinyl sheet flooring. 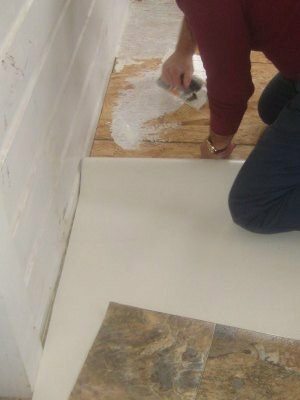 Even though it was a "no glue" product, we used a vinyl flooring adhesive anyway. After that, we can move the washer and dryer back in. As convenient as it is to have the washing machine so close to the clothes line, it'll be nice to not have to run the garden hose and extension cord out to the carport every time I want to do wash.
Last week we ate the last of our homegrown chicken. I've been saving all the bones in a big bag in the freezer. With the chicken gone, it was time to make and can chicken stock. 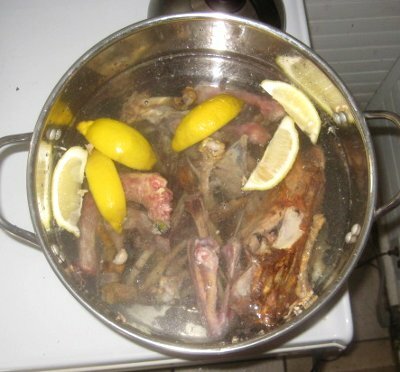 The difference between stock and broth is that stock is made using bones, broth is made from meat. 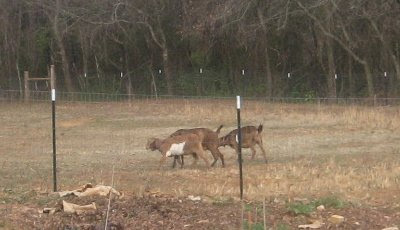 The advantage to stock, is the potential for protein, collagen, and minerals from the bones. I say potential, because a cold water start, long cooking, and an acid are required to extract all of the available nutrients. The acid dissolves calcium out of the bones. I'm using lemons, but vinegar or white wine could be used as well. My stock isn't fancy. I dumped the bones into my biggest pot and covered with water. I don't add vegetables like many recipes call for. 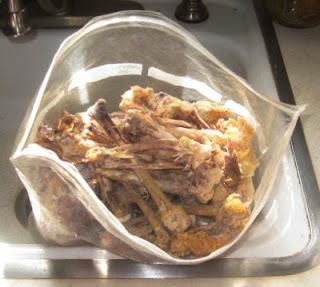 I use leftover bones rather than whole chickens, because this is part of our waste not want not lifestyle. Various directions call for long, barely simmering cooking. Length of time can vary anywhere from all day to several days. You can see in the photo on the left, how this helps soften and extract the collagen from the ends of the bones. Collagen is important for connective tissue health (skin, arteries, joints, tendons, etc). Once it's done cooking, I remove the bones and pick off the bits of meat and often put them back in the stock. Most recipes don't call for this, but Dan likes to find bits of meat in his soup, gravy, rice, etc., so I leave them in. Inedible parts are fed to the chickens. Bones are discarded. While I'm working on that, the stock goes into the fridge for the fat to congeal so I can skim it off. 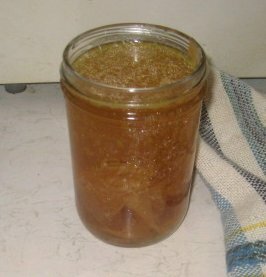 Chicken stock can be frozen, but I have limited space in my freezer, so I can mine. It is processed in pints and quarts in my pressure canner, according to the directions in Ball Blue Book: 20 minutes for pints, 25 minutes for quarts, at 10 pounds pressure. I do freeze my cooking waters as broth, unless used to make gravy. Sometimes I'll add a couple cups of water (no soap!) to "soak" the cooking pan. This softens the scrapings, which I pour into a canning jar and freeze. I use as needed for soups or cooking grains. Making and canning this was a perfect project for the cold rainy spell we had recently. Helped keep the house warm!